Inking Idaho: BIG Bonus Deals Start Today! Today marks the beginning of our Bonus Deals! You can save up to 60% on extra items in the Clearance Rack (while supplies last) and save up to 30% on even more Weekly Deals! Exciting news for those of us who love to save money on our Stampin' Up! supplies. See Clearance Rack items HERE. Weekly Deals discounts are available in limited quantities before the items return to retail prices, be sure to get yours today! Today is the last day for a couple of things you may not want to miss - Sign up as a demonstrator and get 2 FREE stamp sets of your choice and also the last day for my Build A Birthday Accordion Folder tutorial free with a $35+ purchase to my online store. 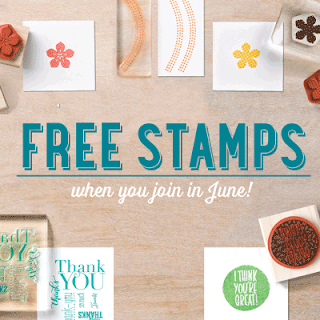 Sign up to be a new demonstrator and you will get to choose 2 FREE stamp sets from the all new catalog!